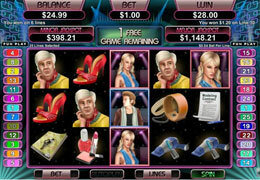 High Fashion – 5 Reel, 25 Payline progressive video slot with bonus features, multipliers, minor and major Jackpots. This game is about the modelling world with all the glitz and glamour, spotlights, and attractive models strutting down the runway. Coins range from 0.01 to 0.25 per payline and players can choose between 1 and 25 lines to bet on. Both Male and Female Models are Wild symbols. The Wilds double the payout when substituting for other symbols in a winning combination. Wilds will only appear on Reels 1 and 5. 5 Runways appearing anywhere on the reels can pay out 1 000x the total bet per spin up to 25 000 coins. This thrilling, glamorous game offers many chances of landing that massive win!